This year heralds CANNIBAL CORPSE’s 25th year as a band and the band plans to celebrate all year long! Metal Blade Records will be releasing one picture disc a month from the band’s expansive catalog (Eaten Back to Life, Butchered at Birth, Tomb of the Mutilated, The Bleeding, Vile, Gallery of Suicide, Bloodthirst, Gore Obsessed, The Wretched Spawn, KILL, Evisceration Plague, Torture). A total of 12 pictures discs will be released, covering all of the band’s full-length studio albums, some of which have never been released on picture disc. 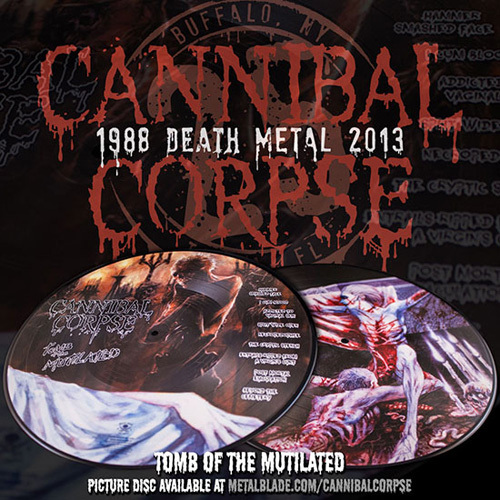 The next picture disc available for preorder is Tomb of the Mutilated, which was released in 1992, and can be found HERE. Additionally, fans in the US can enter to win a copy of the picture disc now at metalblade.com/us/contests. Go to www.jsrdirect.com/bands/cannibalcorpse to check out all the new merch and collectable items available from the band.